Psychiatry developed into a medical specialty area in the late 18th century in France. By the 19th century, the thought of psychiatry as a field of medicine began gaining momentum in other countries, and in 1944, the establishment of the American Psychiatric Association was essential in channeling energy into psychiatry's development here in the United States. Over the next couple of decades, an increasing number of graduating and established physicians began choosing psychiatry as their field of specialty. However, this initial influx was short lived and the trend had slowed down substantially. Over time, an unsustainable status quo emerged, with alarming statistics and predictions of acute mental health provider shortages issued by the Association of American Medical Colleges in 2016. This commentary will discuss the current state of affairs regarding the severe shortage of mental health professionals, including psychiatrists, psychologists, and mental health nurses. Potential solutions to this emerging crisis will be proposed. There is a significant heterogeneity of practice patterns within psychiatry. This, in turn, contributes to unique challenges in terms of patient access to services. For example, approximately 5% of psychiatrists treat only inpatients, and about 15% of practitioners provide only child and adolescent services. In addition, there is a substantial proportion of practicing psychiatrists who are nearing the end of their careers [Figure 1]. Finally, a significant number of psychiatrists choose to reduce their professional commitment to part-time hours for variety of reasons. Decreasing number of psychiatry residencies, fewer graduates from remaining programs, combined with the above-mentioned professional trends within the specialty, all synergistically contribute to the worsening shortage of mental health practitioners. In addition, mental health professions have been experiencing low job satisfaction levels and burnout around the globe, further compounding the already challenging situation and potentially deterring new entrants into the specialty.,, As astutely pointed out by DeMello and Deshpande, “…threat of malpractice lawsuit, practices that admit Medicare patients and patients with considerable out-of-pocket medical expenses can have a negative impact on career satisfaction.” In addition, Prosser et al. point out that community mental health work may be more stressful than hospital work and that providers in the community face significant professional strain due to limited resources and relative lack of support. Although these are not new issues for psychiatrists or other primary care providers, the current crisis is approaching an unsustainable state of affairs. Why, some may ask, is the crisis more urgent today? While the shortage of mental health providers is not a new phenomenon, the problem continues to grow and has become more apparent than ever [Figure 2]. The critical nature of the current situation is due to the fact that concurrent to the decline in the number of trained psychiatrists is the increase in demand for mental health services. For example, the demand for child and adolescent psychiatry services is expected to double between the years 2000 and 2020. It is not difficult to project that the already overextended resources available to behavioral services around the country would not be able to maintain the current and largely inadequate levels of coverage in the face of doubling demand. The same authors also emphasized that only about two-thirds of the resources needed would become available by the end of this decade, provided that current funding and recruitment levels are able to be maintained. The chronic lack of resources and continuing shortage of mental health providers is further compounded by maldistribution of resources that are available to the public. On the one hand, there is the shift of providing care from larger institutions to various community-based programs, which places increasing burden on the often underfunded public mental health services. On the other hand, certain urban areas with overabundance of psychiatrists contrast with more rural regions that have difficulty recruiting mental health professionals.,, A thorough understanding of both the nature and the reasons for such maldistribution is critical when planning for strategic resource allocation. Areas experiencing health-care shortages usually have higher levels of poverty, rural character, and/or larger proportion of minority residents. Thus, populations living in poverty-stricken areas, with greater overall mental health needs, experience limited access to mental health resources, which only exacerbates the already severe shortage. The burden of mental health specialist shortage affects other critically strained areas of the health-care system. Most prominently, the primary care sector has been forced to fill the void resulting from the lack of psychiatrists., It has been reported that approximately two-thirds of primary care physicians (PCPs) experience access-related difficulties when referring patients to mental health outpatient services – a figure twice that of other outpatient services requested by PCPs. Consequently, there is a growing number of PCPs providing screening procedures and psychiatric care to their patients. The reliance on PCPs to provide such specialized care is neither an optimal nor a sustainable solution to the mental health provider shortage. 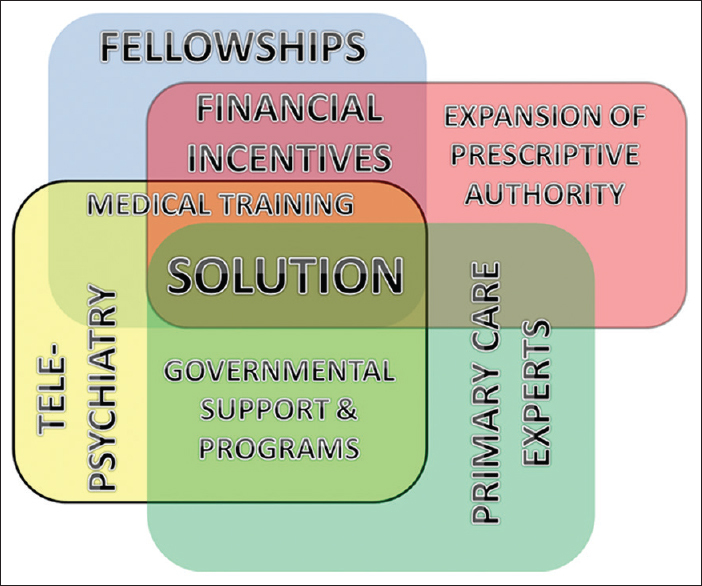 In an effort to come up with sustainable solutions for the ongoing critical shortage of mental health providers and services, a multipronged approach is required to adequately address all of the key areas of need [Figure 3]. This general strategy has been shown to be effective across various settings. 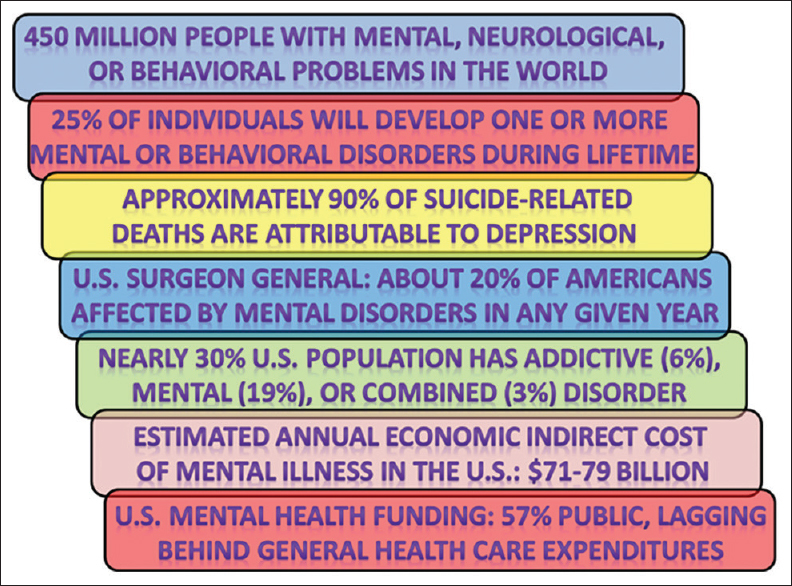 A mental health crisis of the current magnitude is certainly multifactorial, with contributing elements including socioeconomic factors (e.g., lack of insurance coverage or community resources), provider-specific factors (e.g., high indebtedness combined with comparatively lower income levels), and the maldistribution of resources outlined earlier in this manuscript (e.g., ample supply of behavioral health specialists in large cities and near complete absence in rural areas).,, Many underserved areas experiencing mental health and primary care provider shortages are now utilizing incentives specifically designed to recruit new providers, such as loan repayment programs.,, Additional strategies used to attract new providers to this field include “…fellowship stipends, loan forgiveness programs, and clinical reimbursement; other strategies are to diversify the range of training opportunities available by establishing short-term training initiatives to meet specific demands.” This approach has proven somewhat successful; however, high turnover rates in some programs can pose a problem. Among other notable programs, the National Health Service Corps (NHSC) sponsors an initiative that “…recruits fully trained professionals to provide culturally competent, interdisciplinary primary health and behavioral healthcare services to underserved population.” In return, the NHSC assists its participating provider members with student loan repayment. This and similar interprofessional education initiatives are designed to enhance collaborative approaches among public health and social work experts. The effort to integrate behavioral and physical health care helps address the increased demand for mental health services and improve patient outcomes by facilitating early diagnosis and intervention. Another potential component that may bring partial solution to the mental health shortage crisis is the utilization of pediatricians and PCPs to meet the increasing needs of younger patient groups. One such initiative was devised by the Resource for Advancing Children's Health (REACH) Institute. One program sponsored by REACH, the Child/Adolescent Training in Evidence-Based Psychotherapies combines interactive workshops and online curriculum. Another “mini-fellowship” course sponsored by REACH, the Patient-Centered Mental Health in Pediatric Primary Care curriculum provides education for nonpsychiatrist medical providers that features up-to-date training in the use of psychiatric medications for those 18 years of age and younger. This platform is intended to increase the comfort level of PCPs in evaluating and treating mental health issues in the pediatric population. The use of telepsychiatry has grown significantly as a response to the ongoing shortage of mental health-care providers, especially in the context of the underserved populations and regions outlined earlier in our discussion.,, As a technological approach, telepsychiatry can be very effective when treating patients with less severe mental health conditions., In this context, tele-psychiatry increases both accessibility and availability of behavioral health services while reducing the overall cost and the burden on practitioners who can the better focus on providing care for the more severely affected patients., In addition to fulfilling the critical role as an important access point to mental health care and a valuable consultative tool, telepsychiatry further supports “…the entire continuum of care, including patient assessment, psychoeducation, self-managed care, client-provider communication and direct treatment.” Many individuals suffering from behavioral health conditions do not seek professional psychiatric health services out of fear of the negative labeling. To help address these concerns, telepsychiatry offers greater anonymity and decreases the associated stigmas. Utilization of this general approach not only encourages the at-risk population to seek treatment but also provides a valuable resource for sustainable provision of much needed continuity of care. To provide sustainable, long-term solutions to the psychiatrist shortage, attention must focus on the early phases of medical education. The reasons why medical students choose not to pursue psychiatry as a career need to be explored in a systematic fashion. Many students and even physicians view psychiatry as a specialty that does not deal with medical problems the way that other specialties do.,,, There are misconceptions about psychiatric patients among general public and medical students alike., The importance of creating and maintaining vibrant Psychiatry Departments in our teaching medical centers is critical to shaping the attitude of students and medical staff toward this noble specialty. In addition, more emphasis on routine management of common, uncomplicated medical illnesses during psychiatric training might be a powerful incentive for many physicians who like psychiatry but are concerned about losing their general medical skills. It may also be important to include in the medical student curriculum topics related to practice of psychiatry in the “real world,” instead of focusing exclusively on various clinical syndromes and treatment approaches. The ongoing shortage of psychiatrists, combined with the increasing demand for mental health services, is evolving into a major public health crisis. There are several factors that contribute to this state of affairs, including maldistribution of resources, the relative lack of appeal of psychiatry as a medical career, and mismatch between psychiatrist income and levels of debt. Coordinated efforts are needed to address these key barriers to achieving sustainable growth and providing adequate mental health services to our communities. Shorter E, Marshall JC. A history of psychiatry. Nature 1997;386:346. Blain D, Barton M. The History of American Psychiatry: A Teaching and Research Guide. Arlington, Virginia: American Psychiatrie Association; 1979. Liptzin B. The psychiatrist shortage. What's the right number? Arch Gen Psychiatry 1979;36:1416-9. Harahan M. A critical look at the looming long-term-care workforce crisis. Generations 2010;34:20-6. Goldman W. Economic grand rounds: Is there a shortage of psychiatrists? Psychiatr Serv 2001;52:1587-9. Kumar S, Fischer J, Robinson E, Hatcher S, Bhagat RN. Burnout and job satisfaction in New Zealand psychiatrists: A national study. Int J Soc Psychiatry 2007;53:306-16. Gigantesco A, Picardi A, Chiaia E, Balbi A, Morosini P. Brief report: Job satisfaction among mental health professionals in Rome, Italy. Community Ment Health J 2003;39:349-55. Prosser D, Johnson S, Kuipers E, Szmukler G, Bebbington P, Thornicroft G. Mental health, “burnout' and job satisfaction among hospital and community-based mental health staff. Br J Psychiatry 1996;169:334-7. DeMello JP, Deshpande SP. Career satisfaction of psychiatrists. Psychiatr Serv 2011;62:1013-8. Thomas CR, Holzer CE 3rd. 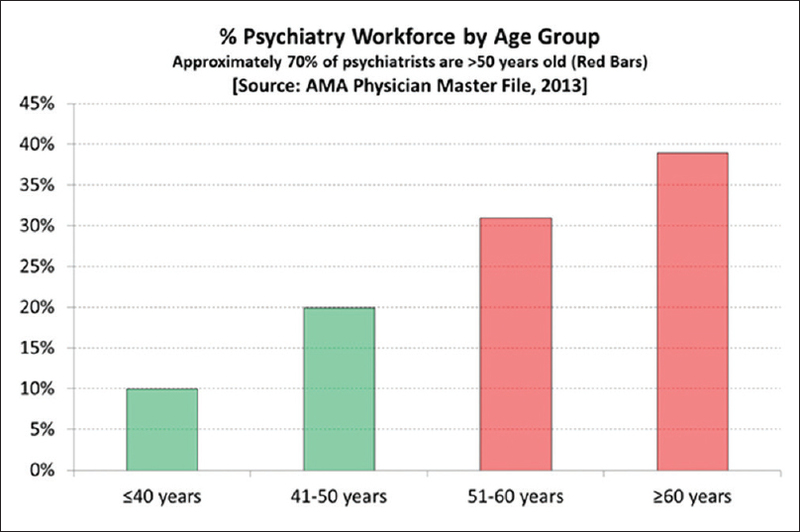 The continuing shortage of child and adolescent psychiatrists. J Am Acad Child Adolesc Psychiatry 2006;45:1023-31. Thomas KC, Ellis AR, Konrad TR, Holzer CE, Morrissey JP. County-level estimates of mental health professional shortage in the United States. Psychiatr Serv 2009;60:1323-8. Hodulik J. The drug court model as a response to “broken windows” criminal justice for the homeless mentally ill. J Crim Law Criminol 2001;91:1073-100. Lazette K. The “squeaky wheel” gets no grease: Persisting problems at the interface of the mental health and the criminal justice systems. Ottawa: Carleton University; 2007. Malone M. Homelessness in a modern urban setting. Fordham Urban Law J 1981;10:749. Kim WJ; American Academy of Child and Adolescent Psychiatry Task Force on Workforce Needs. Child and adolescent psychiatry workforce: A critical shortage and national challenge. Acad Psychiatry 2003;27:277-82. Fraser CE, Smith KB, Judd F, Humphreys JS, Fragar LJ, Henderson A. Farming and mental health problems and mental illness. Int J Soc Psychiatry 2005;51:340-9. Murray JD, Keller PA. Psychology and rural America. Current status and future directions. Am Psychol 1991;46:220-31. Merwin E, Hinton I, Dembling B, Stern S. Shortages of rural mental health professionals. Arch Psychiatr Nurs 2003;17:42-51. Cunningham PJ. Beyond parity: Primary care physicians' perspectives on access to mental health care. Health Aff (Millwood) 2009;28:w490-501. Coleman JV, Patrick DL. Integrating mental health services into primary medical care. Med Care 1976;14:654-61. Gallagher K, Beer T. Solving colorado's health professionals shortage: Initial lessons learned from the health professions initiative evaluation. Available from: https://folio.iupui.edu/bitstream/handle/10244/488/HPI.11-07._FINAL.lowres.pdf. [Last accessed on 2017 Apr 25]. Stubbe DE, Thomas WJ. A survey of early-career child and adolescent psychiatrists: Professional activities and perceptions. J Am Acad Child Adolesc Psychiatry 2002;41:123-30. Grayson MS, Newton DA, Thompson LF. Payback time: The associations of debt and income with medical student career choice. Med Educ 2012;46:983-91. Rosenthal MP, Diamond JJ, Rabinowitz HK, Bauer LC, Jones RL, Kearl GW, et al. Influence of income, hours worked, and loan repayment on medical students' decision to pursue a primary care career. JAMA 1994;271:914-7. American_Hospital_Association. The State of the Behavioral Health Workforce: A Literature Review 2016. Avaialble from: http://www.aha.org/content/16/stateofbehavior.pdf. [Last accessed on 2017 Apr 03]. The_REACH_Institute. The Resource for Advancing Children's Health; 2017. Avaialble from: http://www.thereachinstitute.org/. [Last accessed on 2017 Apr 03]. The_REACH_Institute. Child/Adolescent Training in Evidence-Based Psychotherapies (CATIE); 2017. Avaialble from: http://www.thereachinstitute.org/services/for-healthcare-organizations/staff-training/child-adolescent-training-in-evidence-based-psychotherapies-catie-1. [Last accessed on 2017 Apr 03]. The_REACH_Institute. Patient-Centered Mental Health in Pediatric Primary Care; 2017. Avaialble from: http://www.thereachinstitute.org/services/for-healthcare-organizations/staff-training/primary-pediatric-psychopharmacology.. [Last accessed on 2017 Apr 03]. Benavides-Vaello S, Strode A, Sheeran BC. Using technology in the delivery of mental health and substance abuse treatment in rural communities: A review. J Behav Health Serv Res 2013;40:111-20. Deslich S, Stec B, Tomblin S, Coustasse A. Telepsychiatry in the 21st century: Transforming healthcare with technology. Perspectives in Health Information Management. 2013;10:1-18. Grady BJ, Lever N, Cunningham D, Stephan S. Telepsychiatry and school mental health. Child Adolesc Psychiatr Clin N Am 2011;20:81-94. Hilty DM, Marks SL, Urness D, Yellowlees PM, Nesbitt TS. Clinical and educational telepsychiatry applications: A review. Can J Psychiatry 2004;49:12-23. King VL, Stoller KB, Kidorf M, Kindbom K, Hursh S, Brady T, et al. Assessing the effectiveness of an Internet-based videoconferencing platform for delivering intensified substance abuse counseling. J Subst Abuse Treat 2009;36:331-8. Clarke G, Yarborough BJ. Evaluating the promise of health IT to enhance/expand the reach of mental health services. Gen Hosp Psychiatry 2013;35:339-44. Hilty DM, Rabinowitz T. On-call telepsychiatry services: Interventions, outcomes, and innovations. In: On-Call Geriatric Psychiatry. Basel, Switzerland: Springer; 2016. p. 317-31. Kaas MJ, Moller MD, Markley JM, Billings C, Haber J, Hamera E, et al. Prescriptive authority for advanced practice psychiatric nurses: State of the states, 2001. J Am Psychiatr Nurses Assoc 2002;8:99-105. Moller MD. The business of psychiatric nursing: Cents and sensibility: Part I: Establishing an independent practice. J Am Psychiatr Nurses Assoc 1999;5:54-61. Haber J, Hamera E, Hillyer D, Limandri B, Pagel S, Staten R, et al. Advanced practice psychiatric nurses: 2003 legislative update. J Am Psychiatr Nurses Assoc 2003;9:205-16. Baldwin KA, Sisk RJ, Watts P, McCubbin J, Brockschmidt B, Marion LN. Acceptance of nurse practitioners and physician assistants in meeting the perceived needs of rural communities. Public Health Nurs 1998;15:389-97. Hanrahan NP, Sullivan-Marx EM. Practice patterns and potential solutions to the shortage of providers of older adult mental health services. Policy Polit Nurs Pract 2005;6:236-45. Smalley KB, Yancey CT, Warren JC, Naufel K, Ryan R, Pugh JL. Rural mental health and psychological treatment: A review for practitioners. J Clin Psychol 2010;66:479-89. Bush JW. Prescribing privileges: Grail for some practitioners, potential calamity for interprofessional collaboration in mental health. J Clin Psychol 2002;58:681-96. Jameson JP, Blank MB. The role of clinical psychology in rural mental health services: Defining problems and developing solutions. Clin Psychol Sci Pract 2007;14:283-98. Nielsen AC 3rd, Eaton JS Jr. Medical students' attitudes about psychiatry. Implications for psychiatric recruitment. Arch Gen Psychiatry 1981;38:1144-54. Malhi GS, Parker GB, Parker K, Kirkby KC, Boyce P, Yellowlees P, et al. Shrinking away from psychiatry? A survey of Australian medical students' interest in psychiatry. Aust N Z J Psychiatry 2002;36:416-23. Rajagopal S, Rehill KS, Godfrey E. Psychiatry as a career choice compared with other specialties: A survey of medical students. Psychiatrist 2004;28:444-6. Pinfold V, Toulmin H, Thornicroft G, Huxley P, Farmer P, Graham T. Reducing psychiatric stigma and discrimination: Evaluation of educational interventions in UK secondary schools. Br J Psychiatry 2003;182:342-6.